S-Thunder is continuing their line of compact grenade launchers with these two new launchers, a polymer long barreled 40mm pistol, and a metal short barreled 40mm pistol. These complement the polymer short barreled pistol that is already on the market, and give you additional usage options, including the use of longer shells, as well as the ability to mount optics on the metal launcher. This will be a brief review, as there aren't too many differences between these launchers and the one I've reviewed HERE, so I will try my best to keep this brief and to the point! I obtained these launchers directly from S-Thunder. The packages came using Hong Kong Post through USPS, which arrived quickly and safely, with no apparent issues in transit. They are not yet available in retail stores, however, Evike and On Target Airsoft are normally the first to pick up S-Thunder's models, so I would check there frequently to see when they arrive. The launchers came packaged in foam lined cardboard boxes, to keep them safe during shipping. Unlike the first launcher I received, these launchers had orange plastic rings glued onto the muzzle to comply with federal regulations. The launchers also included a basic manual to show the proper functioning and maintenance. As mentioned, these launchers differ mainly in their construction material, as well as their barrel length. The long launcher's barrel is a bit longer than 7", while the short is the same length as the older model, just under 4.5". Starting with the short, metal launcher, you can see the other major difference, which is the top rail. This allows you to mount optics, as well as perform a rail to rail mount to place this launcher underneath another gun, like an M203. The rail is slightly smaller than spec, however, it will mount the vast majority of optics with no issues. The latch system on the short launcher is made of metal, instead of the plastic on the polymer launchers. It feels a little bit sturdier, and it uses a spring opening device on the barrel. The overall construction is pretty much the same as the old launcher, aside from the metal build material. The long launcher is pretty much identical to the old launcher I reviewed, aside from the additional barrel length. It does not have a top rail, so you cannot mount optics on it without custom work. The balance of the longer barrel allows the long launcher to flip open and closed much easier than the old short launcher. Both launchers feature the same M4 type pistol grip, which can be replaced with a real steel grip if you so desire. They also feature the same S-Thunder trademark on the side of the frame. The trigger pull is dependant on the shell/gas used, but it is certainly manageable for skirmish use. This isn't a high precision tactical pistol we're talking about here, it's a grenade launcher that can fit in your pocket, and in that regard, it certainly does its job well. These launchers are chambered in 40mm, and as such, can use the wide variety of 40mm grenade shells that are on the market. I haven't had any issues with my cache of 40mm shells, so it's pretty safe to say that these will work with anything on the market currently. I prefer to run S-Thunder shells, mainly because they can run a wide variety of gasses and projectiles, plus they are damn loud, and quite powerful. As mentioned above, these are tools to fire 40mm shells, so your performance will vary depending on the shell used. You can have everything from hundreds of BBs in one shot, to large rubber slugs. The sky is the limit with 40mm power. Since these use M4 style pistol grips, you can install pretty much any real steel aftermarket grip you want to make it more comfortable, or to add a unique look. The rail on the short launcher will mount optics to allow for more precise aiming, or, with some additional hardware, let you mount it onto another rail for underslung use. 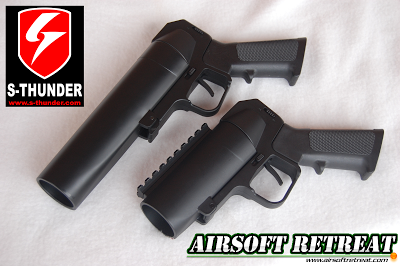 I continue to be impressed with S-Thunder's products, especially their launcher pistol lineup. They keep tweaking their launchers, adding new materials, barrel lengths, and in the future, additional barrels. My hope is that they eventually make a full size launcher with a stock, but for now, I love the launcher pistols!